WeThinkCode_ offers a tuition-free, two-year coding course in Johannesburg, South Africa. WeThinkCode_ democratizes education by making it open and accessible to all talented young people by teaching game design, app design, cloud computing, cryptography, artificial intelligence, web design, malware and more. Students should embody grit, curiosity, connection, and responsibility. Applicants must provide basic information and pass the online application games. In order to apply, one must be between the ages of 17 and 35, and be able to study full-time for two years at one of the campuses in South Africa. 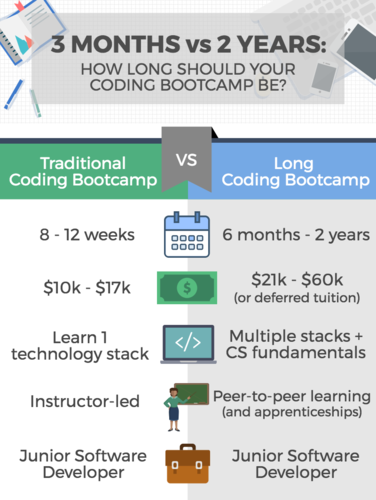 No prior education or coding experience is required. If you are not South African, you are responsible for obtaining the required study visa at your own cost. The Selection Bootcamp is the final stage in the WeThinkCode_ application process where they evaluate the top candidates after a month-long interview process. Courses are sponsored by companies looking to thrive in the digital economy and secure their tech talent pipelines, and there are cost-effective accommodations that have specifically been developed for WeThinkCode_ students. Working with partners like 42 to achieve their mission, WeThinkCode_ is sourcing, training and placing top software engineers. This is a 2-year peer-to-peer programming course where students work with each other to solve problems. Students are required to take a 4-week intensive bootcamp to be invited to enroll in the 2-year course. Students will learn skills applicable to game design, app design, cloud computing, cryptography, artificial intelligence, web design, malware and more. The course is 100% free for WeThinkCode_ students. Corporate sponsors pay your tuition, and in exchange, you will complete two (paid) 4-month internships with them during the course of your studies. Upon successful completion of the course, you will be required to work back the value of your sponsorship (typically 1-2 years) with your sponsor. Just to correct your statement. Students do not pay any placement fee at WeThinkCode. I am a student at WeThinkCode. There are no instructors or lecturers. It is completely peer-2-peer learning. The two intake tests don't have any instructions on purpose, to set those with the correct aptitude apart from the rest. An email with these details has been sent to WeThinkCode_. You've already applied to this scholarship with WeThinkCode_.